With joy I welcome you on the first day of this strong and fraternal time that your Bishop and his Council have proposed to you to live in Rome. I thank Bishop Santier for his words and for this initiative, and through you I extend my cordial greeting and my spiritual closeness to all the faithful of the Diocese of Créteil. Je lui disait: "Vous êtes un évêque qui travaille!". I wish first of all to give thanks to God who has called you and "chosen for the service of his Gospel" (cf. Rom 1: 1), to be among his people faithful administrators of the mysteries of Christ. We live in a context in which the boat of the Church is hit by contrary and violent winds, especially because of the serious faults committed by some of its members. It is all the more important not to forget the humble daily fidelity to the ministry that the Lord allows us to live to the great majority of those who have given to his Church as priests! We know that, responding to the Lord's call, we were not consecrated by the gift of the Spirit to be "superheroes". We were sent with the awareness of being forgiven men, to become shepherds in the manner of Jesus, wounded, dead and risen. Because our mission as ministers of the Church is, today as yesterday, to witness the strength of the Resurrection in the wounds of this world. In this way we are called to progress humbly on the path of holiness, helping the disciples of Jesus Christ to respond to their baptismal vocation, so that they may be ever more missionaries, witnesses of the joy of the Gospel. After all, is not this the meaning of the diocesan Synod that you celebrated in 2016? Dear friends, taking the time to reflect on the revision of the organization of your Diocese, do not be afraid to look at the wounds of our Church, not to complain, but to go up to Jesus Christ. He alone can heal us allowing us to start again from him and find, with him and in him, the concrete means to propose his life to everyone, in a context of poverty and lack. Because "if something must radically worry us and worry our conscience is that so many of our brothers live without the strength, the light and the consolation of friendship with Jesus Christ, without a community of faith that welcomes them, without a horizon of meaning and life "(Apostolic Exhortation Evangelii Gaudium, 49). In this perspective, insistently ask the Holy Spirit to guide you and enlighten you: He will help you, in the exercise of your ministry, to make the Church of Jesus Christ lovable and loving, according to the beautiful expression of the Venerable Madeleine Delbrȇl. With this force coming from above, you will be urged to go out to make you closer to everyone every day, especially those who are hurt, marginalized, excluded. During your pilgrimage to Rome, you will discuss the revival of the pastoral care of vocations to the ordained ministry and to the consecrated life. Let us remember that "where there is life, fervor, desire to bring Christ to others, genuine vocations arise" (ibid., 107). 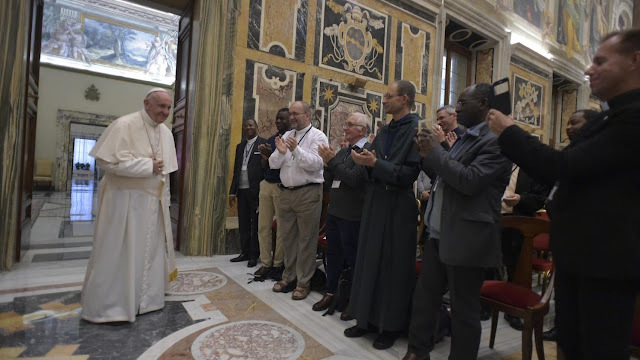 But it is also through your way of living the ministry that you will allow young people to welcome the Lord's call to the priesthood or to the consecrated life. Therefore, I encourage you to keep your gaze fixed on Jesus Christ and to cultivate the particular bond that unites you to him, through personal prayer, listening to his Word, the celebration of the sacraments and the service of the brothers. It is important to foster and develop the quality of fraternal life, among you and within your communities, so that the value and beauty of ministry and of consecrated life are recognized by all as the service of true missionary communion! Drawing from the source of the grace of your call and with the power of the Holy Spirit, you will be witnesses to that hope which does not disappoint (cf Rom 5: 5), despite the difficulties and fatigue of every day; you will manifest, through your daily life, and even in the experience of your fragility, that the gift of life at the service of the Gospel and of the brothers is a source of joy that no one can take away from us. It transpires in you this joy which is deepened in friendship with the Lord and in the constant renewed attention to others, especially the little ones and the poor. But above all, let yourselves be transformed and renewed by the Holy Spirit to recognize the word that the Lord Jesus wants to offer to the world through your life and your ministry (cf. Apostolic Exhortation Gaudete et exsultate, 24). With this hope, I entrust you to the Lord, through the intercession of the Virgin Mary and the prayer of the Venerable Madeleine Delbrȇl, and impart my Apostolic Blessing to you and to all the faithful of the Diocese of Créteil. And please, pray for me as I pray for you! Thank you.